Samsung, the award-winning camcorder design innovator, combines superior picture with a host of new features in a next-generation line of Mini-DV Mega camcorders that is 15% smaller in size than last year's models. 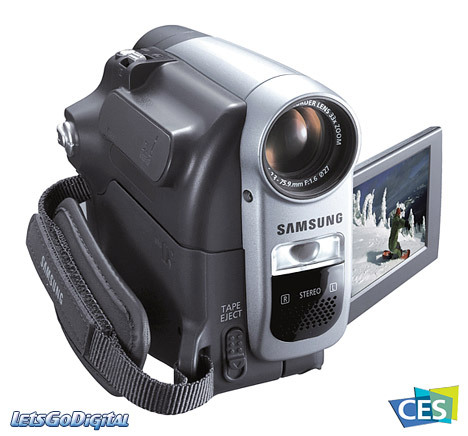 The new Samsung D965 Mini DV Mega camcorder offers Samsung's latest usability enhancements along with high optical zoom for superior picture in a compact camcorder. Samsung's entire Mini-DV line will be on display during Consumer Electronics Show (CES) 2006 in Las Vegas, US. "The Samsung D965 represents an innovative combination of form and function," said Aaron Novak, Marketing Manager for Camcorders, Samsung Electronics America. The SC-D965 will be available in February 2006 for $449.99. Samsung D965 - 1 Megapixel CCD - Samsung's SC-D965 Mini DV Mega camcorder model features a 1.1 Megapixel CCD with 26x Optical Zoom. The step-up SC-D965 offers a 2.7 inch Wide 230K High Resolution LCD, with a 4-in-1 multi memory card slot and 64MB of built-in memory. The Samsung D965 MiniDV Mega camcorder features true Samsung flexibility with 1152 x 864 digital still image capture, MPEG4 video recording and web cam capability. The Samsung SC-D965 model also offers USB 2.0 connectivity for fast, easy file transfer and PictBridge technology. Samsung mini DV camcorder - Widescreen and Operation - "The ultra-compact design combines convenience, elegance and portability with high-quality image capture and an array of new feature enhancements designed to provide consumers with the ultimate value-rich camcorders." 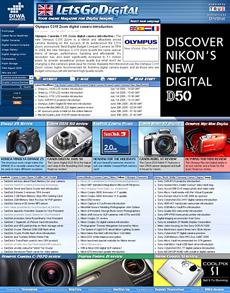 All of Samsung's 2006 Mini-DV camcorder models feature the company's latest functionality enhancements. Topping the list is true 16:9 wide mode. When the 16:9 effects are selected, widescreen footage can be displayed on a digital TV through the Samsung camcorder without image distortion. New recording and playback features enhance the home video experience. For recording, Wind Cut Plus lets users keep original sound and cut only background wind noise, while the Stereo Enhancement feature creates a vivid divide between right and left channels for a stereo sound field effect. Playback audio effects allow users to focus audio playback on the human voice, music or sound direction and add echo effects. An advanced GUI provides easy navigation of camera functions, and the upgraded battery information provides detailed battery status to let you know when the power is low.